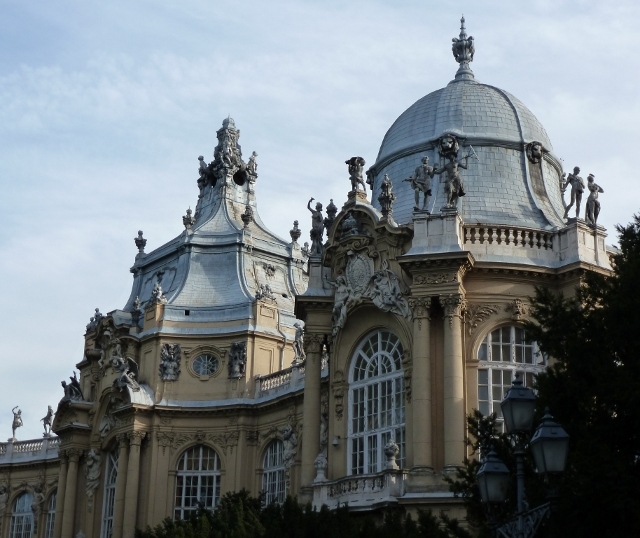 When we got to Budapest, our first priority was to locate a dentist – the toothache that’d started to gently nag was becoming difficult to ignore. The staff at the campsite were helpful – not only did they recommend a dentist in the centre of town, but they phoned them and made the appointment, making sure that all was as sorted as it could be. 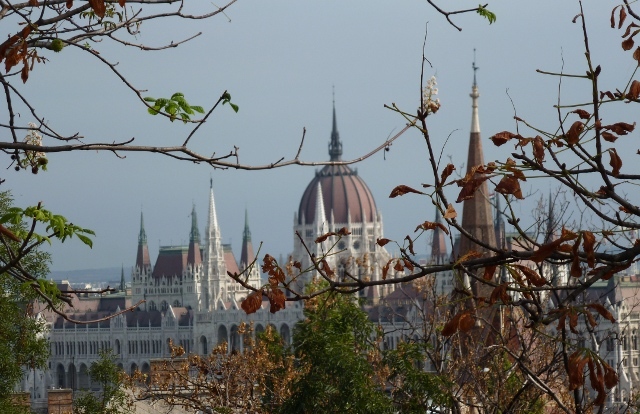 Budapest isn’t just Budapest, it’s Buda and Pest. 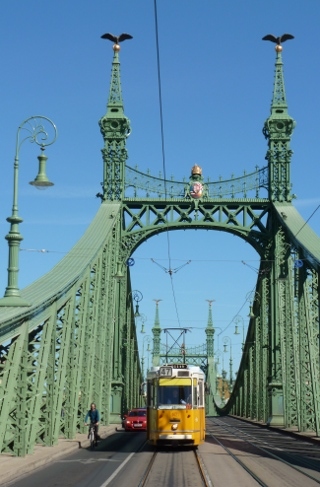 Two banks of the Danube, linked by several beautiful bridges, all rebuilt after every one was destroyed as the Soviet Red Army fought to recapture the city from the Nazis; but are they one city – or two cities? Buda, the left bank, is the pretty half. The castle sits on top of a solid bank of rock. Just next to it, another bank of rock is crowned with the citadel. Behind them, hills rise with expensive green-fringed suburbs. To one end, the 18th century castle complex (right next door to the President’s office, complete with uniformed guard trying very hard to keep straight faces and ignore the tourists posing for silly photos) houses several museums, including the Budapest History Museum – which started off as a bit of a ho-hum wander past the usual collection of historical footnotes, before a set of stairs led us down to the cellars of the original medieval Royal Palace. The trail led us through various quarters, from Baroque hall to chapel to gardens and fortification walls. 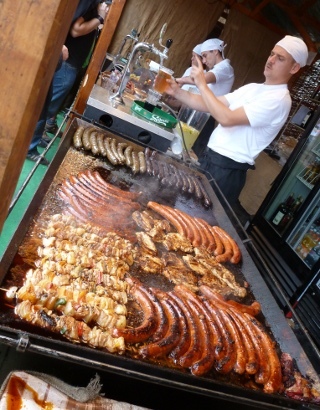 An unexpected bonus had already greeted us – the courtyards of the castle were hosting a food fair! Oh, dear. 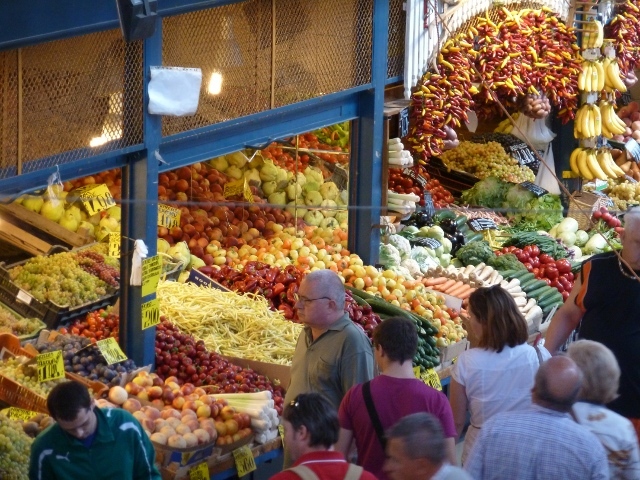 What a pity… Stall after stall of small-scale, high-quality food producers. Strangely, though, very few were actually giving tastings. Our first wander through was just about opening time, with most stalls still setting up – not a problem for some, especially one stand selling home-made cheese who virtually press-ganged us to taste their wares. We did not leave empty-handed, thanks in large part to the translation skills of their neighbour, selling wonderful home-made cordials (the Elderflower & Mint was acquired), who had previously worked as a hospital porter barely ten miles from our home! 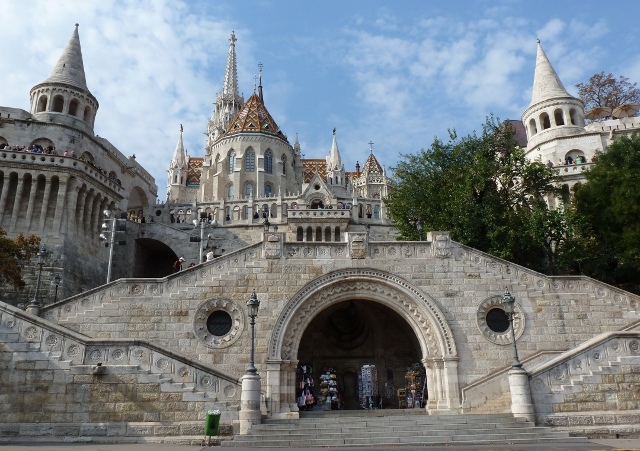 Whilst it didn’t give any discount for the wonderful wooden funicular heading down from the castle to the river, one of the “benefits” of our Budapest card was a free walking tour – alternate days, Buda and Pest. We thought this sounded like a good plan, so stood waiting for the Buda tour. We weren’t the only ones – an Italian couple were there, and we were joined by an American couple. No guide showed… We waited, we waited – we ended up phoning the number in the booklet. No answer. Hey-ho. With stress like that, there’s only one thing to do – and that’s take advantage of the thermal spas rising underneath Buda. The city has umpteen baths, with a legacy back to Roman times. We decided that a wonderful way to waste an afternoon was just lolling about in the Rudas baths, dating back to the 16th century. We sprawled in a variety of mildly-sulphurous pools, ranging in temperature from warm to teabag, underneath a beautiful domed ceiling studded with coloured glass, back-lit by the setting sun. Occasionally, we stirred ourselves to wander through to the ridiculously scorching saunas and scalding steam-rooms, punctuated with dives into the cold plunge pool. Pest, on the other hand (or bank) is the dynamic half. We wandered around, back and forth, from Szabadság Ter, a large green square just at the back of the Parliament building, with a dramatic Art Nouveau house and museum at one end, and one side barricaded off due to rebuilding the US embassy, right next to the soaring and colourful National Savings Bank building; all the way to the huge, lively and thriving market hall at the other end of the centre. Throughout the beautiful old hall, stalls groaned under the weight of bright-red paprika or large sausages hanging above the massed heads of customers and tourists. Upstairs, stalls selling a variety of genuine craft and utter tat, together with hot food stands, were barely visible through the wall of people trying to squeeze by. We just missed the premiere of a new opera, shown to the public for free on big screens in the middle of the main Andrassy Utca avenue. Way off at the top end of Andrassy, the wide open Heroes Square is a dramatic space, with the Millenial Monument colonnade curving round the back to celebrate a thousand years of the country’s foundation in 896, and flanked on either side by art museums. We wandered around the Fine Art Museum, and got lost in room after room of big-name Old Masters, with no fuss or shouting about them. Just a Rembrandt or an El Greco or a Tintoretto or three, quietly taking their place amongst lesser-known contemporaries. 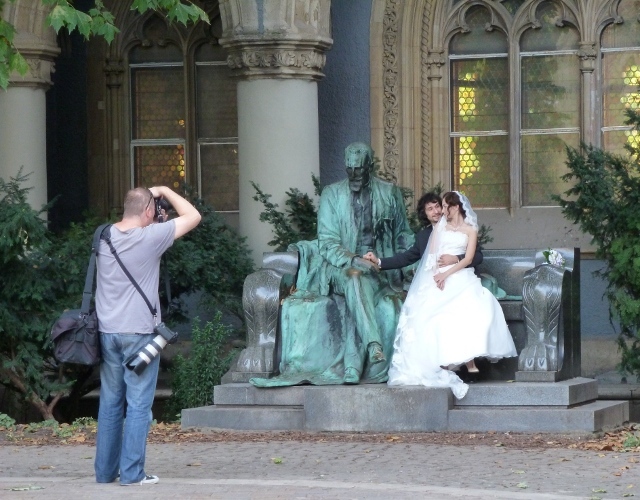 Behind the square, the Városliget or City Park surrounds the Vajdahunjad castle, a gothic fantasy now containing the remarkably prosaic sounding Agricultural Museum, and acting as backdrop for some wedding photos when we were there. After getting thoroughly lost in the park, we found ourselves at a modern sculpture, taking the place of the gigantic statue of Stalin ripped down in the short-lived 1956 revolution. The long boulevard of Andrassy sits above the yellow metro line – Budapest’s first, and the first in the world apart from that in London. Most of the stations have never been rebuilt, and you descend from the road straight onto wonderfully cosy wood panelled and tiled platforms. 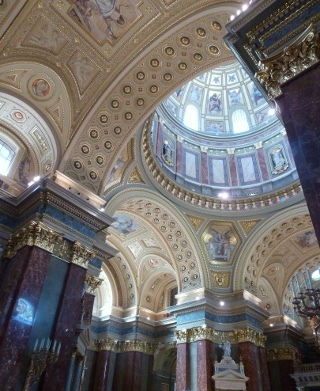 By the main Saint Stephen’s cathedral – with dramatic gilded fixtures and fittings, and a small chapel containing the “Holy Right”, the mummified hand of Hungary’s patron saint and 10th century king – we found a wine bar stocked only with the produce of some of the country’s small vineyards. As a contrast, we then headed off to a “Ruin Pub” – a Budapest speciality, semi-derelict buildings being taken over for bars that sprawl through umpteen scruffy and randomly-decorated back rooms. This one also had a huge central internal courtyard, with large owl sculptures suspended above you, staring down… We stopped in at a cake shop and tearoom unchanged for a hundred years (apart from the large flat-screen TVs, trying to fade into the background in huge gilded frames, showing dubbed Jamie Oliver) and a cool restaurant-lounge with excellent modern-traditional food. Between Buda and Pest, we wandered the length of Margaret Island, a giant park in the middle of the river. And, yes, we did also find the dentist, where I endured quite literally four hours of work on an inflamed root canal across three appointments. The treatment was superb, though, and an absolute bargain compared to the likely cost at UK private dental prices! A week’s delay was needed in the middle for the antibiotic tablets to take effect (once we’d trekked around the city to find the late-night pharmacy), so we headed out for a few days to the Danube Bend – and changed campsites on our return, as the first one had closed for the winter. A pity, as we’d met some great people there – Casper & Chloé, heading by Land-Rover to Cape Town from Copenhagen; Glynn, heading from the UK by Harley-Davidson for a weekend bike rally in Bulgaria; A couple of Norwegians taking their seven (yes, seven) dachsunds to a dog show in Bucharest; Benjamin, a local resident who also runs motorbike tours of the surrounding countries. 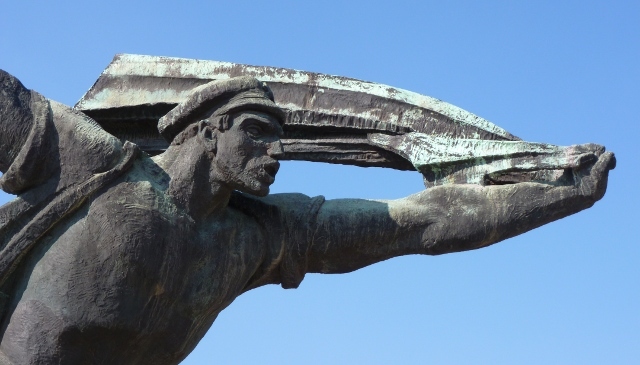 The one “sight” we visited on our return trip was Memento Park – a surprisingly small out-of-town venue to which many of the big communist statues were relocated in the early ’90s. At the entrance, Stalin’s boots greeted you, near a somewhat sad looking Trabi, sagging from all the thousands of tourists who’d sat on and in it. The statues inside ranged from plaques commemorating long-forgotten socialist heroes to a dynamic, thrusting figure soaring high above us mere mortals. 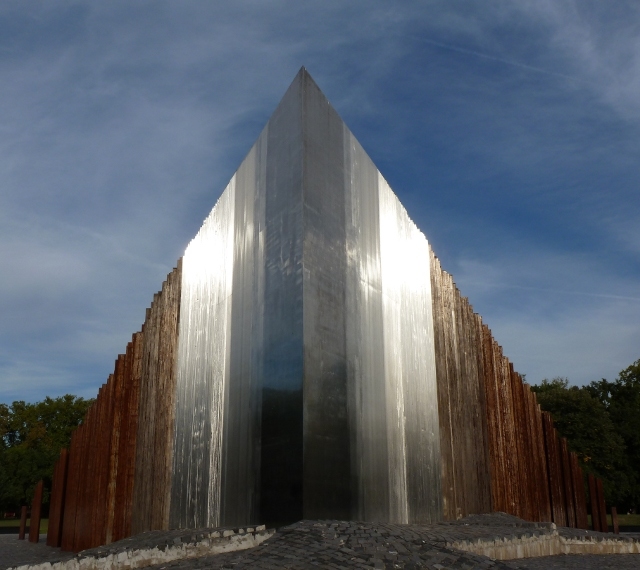 A hut outside contained a temporary exhibition including a series of Secret Police training films – you want to know how to recruit informers or search a flat? We’re your experts now! This entry was posted in Art & Culture stuff, By Country - Hungary, Food stuff, Personal stuff. Bookmark the permalink.